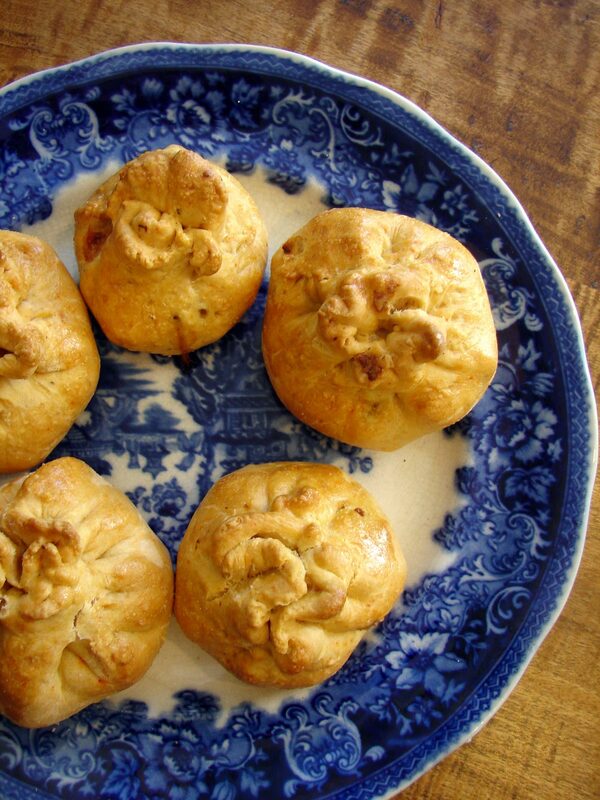 I invented these little dumplings because I wanted something to serve with my pecan tarator sauce. I tried to think of something that would complement the earthy nutty flavor, but that would bring some surprising elements of its own to bring to the table – the dinner table, that is. I think these have a nice balance of flavors and textures. Sweet soft roasted squash, sharp briny capers, crunchy pecans, and smoky smoked gouda. The pastry on these is different from a regular paté brisée. It’s softer, and (as I imagine it) more dumpling-like. It’s actually loosely based on knish-dough recipes that I have read. It contains no butter! It’s not vegan, because it has an egg in it. But if you’re trying to avoid butter (why would you do that?) this is a good one to try. I added a little Spanish paprika to the crust, to echo the smokey flavor of the gouda, and to make them a lovely rosy color. Here’s Johnny Otis‘ Harlem Nocturne, which is just a remarkable piece of music. Mix the flour, salt, paprika, baking powder in a large bowl. Add the egg and olive oil, and mix till you have a nice workable dough. You might need to add a few tablespoonfuls of water to bring it all together. Knead for a couple of minutes, till it’s nice and smooth. Wrap and put in the fridge till you’re ready to use it. Peel the squash, scoop the seeds out, and cut it into 1/3 inch dice. Mix it with the shallot, thyme, rosemary and basil, and spread it evenly on a baking sheet. Roast at 425 till it’s starting to brown and caramelize, about 20 minutes to half an hour. Mix in all of the beaten egg except a tablespoonful or two. Take the dough out of the fridge. Break off a golf-ball-sized amount and roll it into a rough circle about 1/8th inch thick. It will be 5 or 6 inches wide. Scoop a heaping tablespoonful of filling in the middle. About 1/4 cup. You should have an inch of pastry all around. Pull the pastry up around the filling, and squeeze the neck together like pulling the drawstring on a sack, leaving a pretty flower-like top. Arrange on a baking sheet. Poke with a fork in two places each. Brush each with the remaining beaten egg. Bake at 375 for about 1/2 an hour, till they’re starting to brown. Serve with pecan tarator sauce, or pesto sauce, or tomato sauce, or any sauce you like! This entry was posted in basic pie filling, crust, pie, recipe and tagged butterless pastry dough, butternut squash, capers, dumplings, pecans by Claire. Bookmark the permalink. I love this recipe! I am going to have to make some soon.